Discusses the assessment and classification of visible damage resulting from structural distortion. Includes a table classifying cracks from category 0 (hairline cracks of less than about 0.1mm width) to category 5 (cracks usually greater than 25mm width). 8 pages. 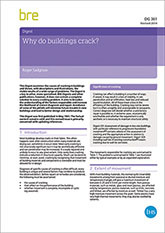 Unfortunately the two photographs of cracking in walls are not very clear when printed out because the original publication had to be scanned to create a pdf. Adjusting the contrast in Adobe® Reader or on your printer should help.